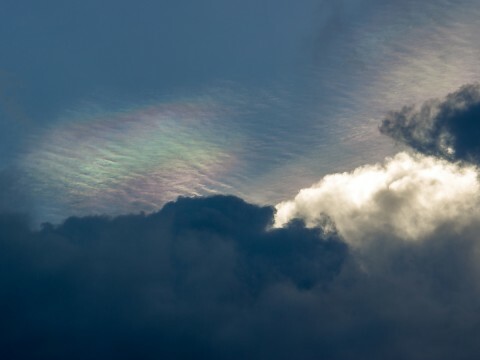 When parts of clouds are thin and have similar size droplets, diffraction can make them shine with colours like a corona. In fact, the colours are essentially corona fragments. 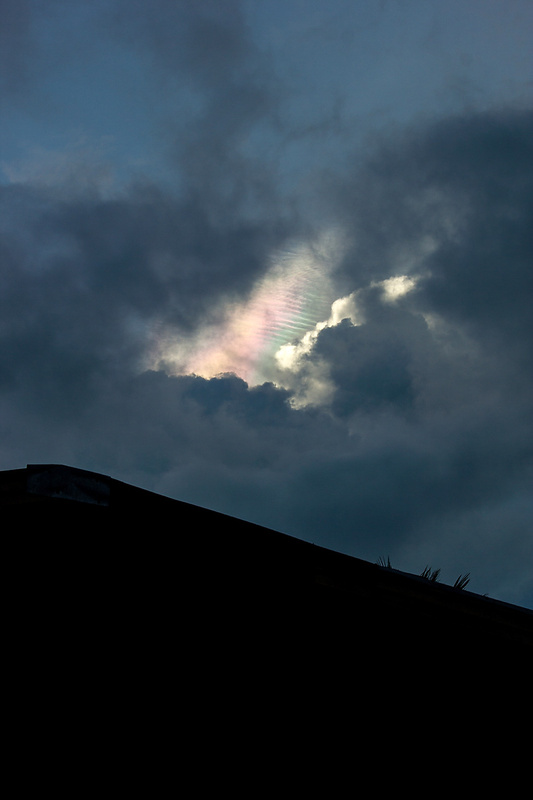 The effect is called cloud iridescence or irisation, terms derived from Iris the Greek personification of the rainbow. You can read more on the website. A few other sites I checked mentioned that although these types of rainbows are not extremely rare, they are rather uncommon. It was lucky that the clouds broke from being overcast earlier in the day. I took a few photos of the rainbows, which were quite close to the sun. The disc of the sun was blocked by other clouds, but the glare was still intense, so I had to drastically underexpose in order to capture the colors in the clouds. The rainbow on the right in the first photo below was highlighting a pileus cloud that was on top of a cumulus cloud. 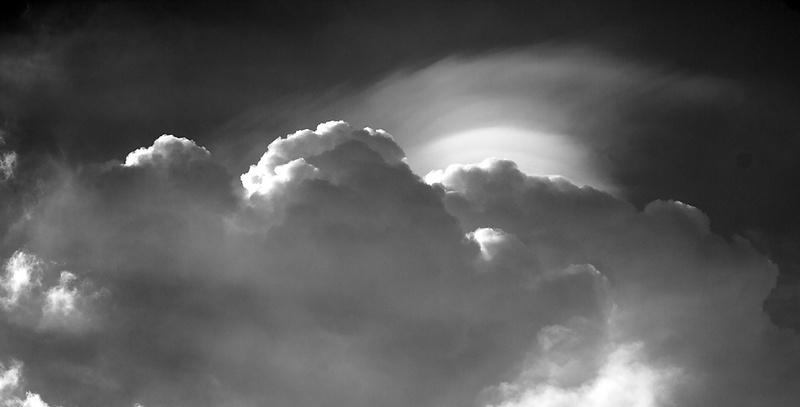 The same website has a simple explanation of a pileus cloud. It lasted about 15 minutes, whereas the iridescent cloud on the left coloring the cirrocumulus clouds persisted for about an hour. These pictures, unfortunately, don’t give a true rendition of how beautiful the event was. The one on the right appeared only briefly, but the one on the left lasted for an hour. Here’s how the cirrocumulus cloud appeared from the second floor window of the house at The Farm, followed by a close up view using the telephoto zoom lens on my camera. From the window of the house at The Farm. Our neighbor’s house is the dark shape at the bottom of the photo. I wanted to give some scale to the photo, so I didn’t crop it out. A close up taken with the telephoto zoom lens on my camera, approximately 150 mm. There were some other interesting cloud formations that day. 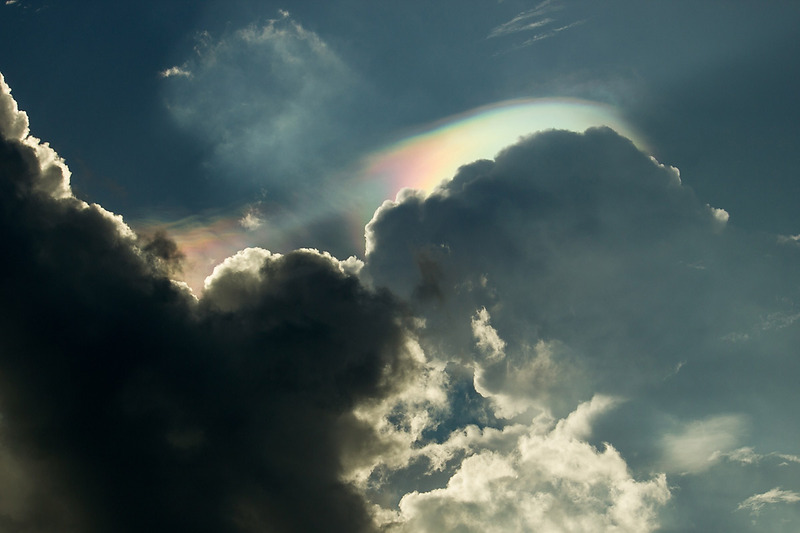 The first one below is the cumulus and pileus clouds as they appeared after the rainbow dissipated. 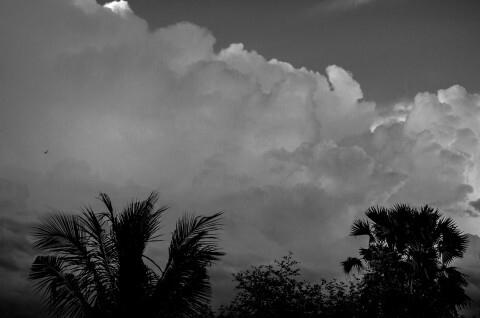 The other photo shows some rain clouds off to our south, moving toward Thailand. I converted these to black and white to add more drama, in my opinion, and as a change of pace from the usual color photos I post. There wasn’t much color in these to begin with, so I think B&W is appropriate. The pileus cloud sits atop the cumulus. It looked like a strong thunderstorm might develop, but it fizzled out after awhile. Looks like a heck of a storm heading for Thailand. Finally, here’s a sunset that was captured the day before the above photos were made. Lots of nice sunsets lately with all the moisture in the air.